You can start creating a new course straight from your Library. In order to do so, you need to have bookmarked content in your Library, either using the "Add to Schoox" Tool or selecting the "Add URL" button or the "Upload file" button at the top of your Library. Once you have content stored or bookmarked in your Library, you can just choose it (while in your Library) by dragging and dropping it to the bottom of the page inside the "Create Course" box. You can filter you library and go to the public library. The session with the block remains and follows you until you click on save or cancel. You can continue dragging and dropping content in the box. 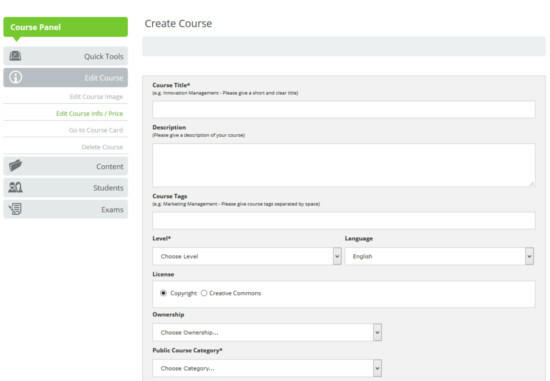 Once you have all your content added, you can select to save the course. You will then be directed to the "Course Edit Info" page where you can add more info about your course. Just click the "Private" Button at the top the course card to make it "Public".